اندازه (چپ) و فاصله (راست) شمار اندکی از کهکشان‌های مشهور در مقیاس . در حدود ۵۱ کهکشان در گروه محلی وجود دارد. در ابرخوشهٔ محلی ما در حدود ۱۰۰٬۰۰۰ کهکشان وجود دارد و در جهان قابل مشاهده برای ما در حدود دو هزار میلیارد کهکشان وجود دارد. هیچ نامگذاری جهانی مورد توافق همگان برای کهکشان‌ها وجود ندارد، چرا که بیشتر آنها پیش از اینکه مشخص شود آیا یک کهکشان است یا پیکرهای دیگر آسمانی، فهرست بندی شده‌اند. بیشتر آنها با مختصات آسمانی خود همراه با نام پروژه شناسایی می‌شوند، مانند (HUDF, SDSS, 3C, CFHQS, NGC/IC و غیره). باغ کهکشانی (به انگلیسی: Galaxy Zoo) پروژه‌ای است با هدف به دست آوردن یک فهرست کامل تر: این پروژه در ژوئیه ۲۰۰۷ آغاز شده و تا کنون بیش از یک میلیون تصویر کهکشان را از سرشماری دیجتال آسمان سالون (به انگلیسی: The Sloan Digital Sky Survey)، تلسکوپ فضایی هابل و بررسی ماترک امواج کیهانی نزدیک به زیرقرمز ژرف فضا (به انگلیسی: Cosmic Assembly Near-Infrared Deep Extragalactic Legacy Survey) فهرست نموده‌است. کهکشان سیه‌چشم گیسو It has a spectacular dark band of absorbing dust in front of the galaxy's bright nucleus, giving rise to its nicknames of the "Black Eye" or "Evil Eye" galaxy. کهکشان دنباله‌دار سنگتراش (صورت فلکی) این کهکشان به دلیل ظاهر غیرعادی که مانند یک دنباله‌دار به نظر می‌رسد، کهکشان دنباله‌دار نامیده شده‌است حالت دنباله‌دار به سبب کشش جزر ومدی در خوشه کهکشانی ابل ۲۶۶۷ است. Cosmos Redshift 7 Sextans The name of this galaxy is based on a redshift (z) measurement of nearly 7 (actually, z = 6.604). Galaxy Cosmos Redshift 7 is reported to be the brightest of distant galaxies (z > 6) and to contain some of the earliest first stars (first generation; Population III) that produced the chemical elements needed for the later formation of planets and life as we know it. کهکشان آفتاب‌گردان تازی‌ها Similar in appearance to a sunflower. این فهرستی از کهکشان‌هایی است که با چشم غیرمسلح دیده می‌شود. دست کم چشم تیزبین در شب بسیار تاریک در ارتفاعات و آب وهوای بدون تغییر شدید نیاز است. کهکشان راه شیری ۲۶٫۷۴- خورشید ۰ کمان (صورت فلکی) کهکشان راه شیری کهکشانی است که زمین ما در آن قرارگرفته و با چشم غیر مسلح بخشی از آن دیده می‌شود این بخش شامل ناحیه پرهیز (Zone of Avoidance) نیز می‌شود. امگا قنطورس ان‌جی‌سی ۵۱۳۹ ۳٫۷ ۱۸ هزار سال نوری یا ۵٫۵ پارسک قنطورس زمانی گمان می‌شد که یک ستاره است و بعدها گمان شد که یک خوشه ستاره‌ای کروی است؛ ولی بعداً تأیید شد که دارای یک سیاه چاله در مرکز خودش است و در آوریل ۲۰۱۰ به عنوان یک کهکشان کوتوله شناخته شد. کهکشان سه گوش M33, NGC598 ۵٫۷ ۲٫۹ میلیون سال نوری یا ۹۰۰ هزار پارسک سه سو Being a diffuse object, its visibility is strongly affected by even small amounts of light pollution, ranging from easily visible in direct vision in truly dark skies to a difficult averted vision object in rural/suburban skies. مسیه ۸۱ (M81, NGC3031) ۷٫۸۹ 12 Mly (3.6 Mpc) Ursa Major Highly experienced amateur astronomers may be able to see Messier 81 under exceptional observing conditions. کهکشان سنگ‌تراش (NGC 253) ۸٫۰ ۱۱٫۴ ± 0.7 Mly (۳٫۵ ± 0.2 Mpc) Sculptor According to Brian A. Skiff, the naked-eye visibility of this galaxy is discussed in an old Sky & Telescope letter or note from the late 1960s or early 1970s. مسیه ۸۳ (NGC 5236) ۸٫۲ 14.7 Mly (4.5 Mpc) Hydra M83 has reportedly been seen with the naked eye. Sagittarius Dwarf Elliptical Galaxy is not listed, because it is not discernible as being a separate galaxy in the sky. نخستین کهکشان کهکشان راه شیری & کهکشان زن برزنجیر Sagittarius (centre) & Andromeda ۱۹۲۳ ادوین هابل determined the فاصله to the Andromeda Nebula, and found that it could not be part of the Milky Way, so defining that Milky Way was not the entire universe, and making the two separate objects, and two galaxies. However, the first galaxies seen would be all of the naked-eye galaxies, but they were not identified as such until the 20th century. نخستین radio galaxy Cygnus A Cygnus ۱۹۵۲ Of several items, then called radio stars, Cygnus A was identified with a distant galaxy, being the first of many radio stars to become a radio galaxy. ۱۹۶۰ 3C273 was the first quasar with its redshift determined, and by some considered the first quasar. 3C48 was the first "radio-star" with an unreadable spectrum, and by others considered the first quasar. نخستین Seyfert galaxy مسیه ۷۷ (M77) Cetus ۱۹۰۸ The characteristics of Seyfert galaxies were first observed in M77 in 1908, however, Seyferts were defined as a class in 1943. نخستین low surface brightness galaxy Malin 1 Coma Berenices ۱۹۸۶ Malin 1 was the first verified LSB galaxy. LSB galaxies had been first theorized in 1976. First discovered object, later identified to be a cannibalized galaxy امگا قنطورس Centaurus Omega Centauri is considered the core of a disrupted dwarf spheroidal galaxy cannibalized by the Milky Way, and was originally catalogued in 1677 as a nebula. It is currently catalogued as a globular cluster. First spiral galaxy کهکشان گرداب Canes Venatici ۱۸۴۵ Lord William Parsons, Earl of Rosse discovered the first spiral nebula from observing the M51 white nebula. این فهرست از کهکشان‌های نمونه اصلی دسته‌ای از کهکشان‌های به‌شمار می‌آیند. BL Lac object BL Lacertae (BL Lac) Lacerta This AGN was originally catalogued as a ستاره متغیر، and "stars" of its type are considered BL Lac objects. Least separation between binary central black holes 4C ۳۷٫۱۱ 24 ly (7.3 pc) Perseus OJ 287 has an inferred pair with a 12 year orbital period, and thus would be much closer than 4C 37.11's pair. نزدیکترین کهکشان‌ها Canis Major Dwarf Canis Major 0.025 Mly Discovered in 2003, a satellite of the Milky Way, slowly being cannibalized by it. دروترین کهکشان‌ها UDFj-39546284 Fornax z≃۱۰٫۳ With an estimated فاصله of about 13.2 billion LY, it is announced as the oldest and farthest astronomical object known. Closest quasar ۳سی ۲۷۳ Virgo z=۰٫۱۵۸ First identified quasar, this is the most commonly accepted nearest quasar. Most distant quasar CFHQS J2329-0301 Pisces z=۶٫۴۳ Discovered in 2007. Closest blazar Markarian 421 (Mrk 421, Mkn 421, PKS 1101+384, LEDA 33452) Ursa Major z=۰٫۰۳۰ This is a BL Lac object. Most distant blazar Q0906+6930 Ursa Major z=۵٫۴۷ This is a flat spectrum radio-loud quasar type blazar. Apparently brightest galaxy Baby Boom Galaxy [نیازمند بازبینی منبع] کهکشان ستاره‌فشان located in the very distant universe. Intrinsically brightest galaxy قدر مطلق (ستاره‌شناسی) Markarian 231 is the most luminous nearby galaxy (~590 Mly; apmag ۱۳٫۸). Intrinsically faintest galaxy Boötes Dwarf Galaxy (Boo dSph) قدر مطلق (ستاره‌شناسی) -۶٫۷۵ This does not include dark galaxies. Visually brightest galaxy ابر ماژلانی بزرگ قدر ظاهری ۰٫۶ This galaxy has high surface brightness combined with high apparent brightness. Visually faintest galaxy This galaxy has low surface brightness combined with low apparent brightness. Visually largest galaxy ابر ماژلانی بزرگ ۶۵۰ × 550 arcsec The LMC takes up more of the sky than any other galaxy, due to its nearness to us. NOTE: The Milky Way Galaxy, our galaxy, cannot be measured, as we reside inside it. However, if only counting the Milky Way, that bright path in the sky, it would be by far the largest. Visually smallest galaxy Many distant galaxies are unresolvable, and cannot have their angular size determined. ۱ کهکشان راه شیری ۰ This is our galaxy, we are part of it. Mly represents millions of سال نوریs, a measure of فاصله. فواصلare measured from Earth, with Earth being at zero. ابر ماژلانی بزرگ antiquity − ۱۹۹۴ 0.163 Mly This is the upper bound, as it is nearest galaxy observable with the naked-eye. ابر ماژلانی کوچک ۱۹۱۳–۱۹۱۴ This was the first intergalactic فاصله measured. In 1913, اینار هرتس‌اشپرونگ measures the فاصله to SMC using متغیر دلتا قیفاووسیs. In 1914, he did it for LMC. کهکشان زن برزنجیر ۱۹۲۳ This was the first galaxy determined to be not part of the Milky Way. امگا قنطورس does not appear on this list because is not currently considered a galaxy, per se, it is considered a former galaxy, and all that remains of one that was cannibalized by the Milky Way. Most remote quasar ULAS J1120+0641 ۲۰۱۱ z=۷٫۰۸۵ This is the undisputed most remote quasar of any type, and the first with a انتقال به سرخ beyond 7. UDFj-39546284 ۲۰۱۱ - z=۱۰٫۳ This was the remotest object known at time of discovery. IOK-1 ۲۰۰۶ − ۲۰۱۰ z=۶٫۹۶ This was the remotest object known at time of discovery. In 2009, gamma ray burst GRB 090423 was discovered at z=8.2, taking the title of most distant object. The next galaxy to hold the title also succeeded GRB 090423, that being UDFy-38135539. SDF J132522.3+273520 ۲۰۰۵ − ۲۰۰۶ z=۶٫۵۹۷ This was the remotest object known at time of discovery. SDF J132418.3+271455 ۲۰۰۳ − ۲۰۰۵ z=۶٫۵۷۸ This was the remotest object known at time of discovery. HDF 4-473.0 ۱۹۹۸ − ۱۹۹۹ z=۵٫۶۰ This was the remotest object known at the time of discovery. RD1 (0140+326 RD1) ۱۹۹۸ z=۵٫۳۴ This was the remotest object known at time of discovery. This was the first object found beyond redshift 5. 8C ۱۴۳۵+۶۳ ۱۹۹۴ − ۱۹۹۷ z=۴٫۲۵ This is a radio galaxy. At the time of its discovery, quasar PC 1247-3406 at z=4.73, discovered in 1991 was the most remote object known. This was the last radio galaxy to hold the title of most distant galaxy. This was the first galaxy, as opposed to quasar, that was found beyond redshift 4. 1 Jy 0902+343 (GB6 B0902+3419, B2 ۰۹۰۲+۳۴) ۱۹۸۸ − ۱۹۹۰ z=۳٫۳۹۵ This is a radio galaxy. At the time of discovery, quasar Q0051-279 at z=4.43, discovered in 1987, was the most remote object known. In 1989, quasar PC 1158+4635 was discovered at z=4.73, making it the most remote object known. This was the first galaxy discovered above redshift 3. It was also the first galaxy found above redshift 2. 3C ۲۵۶ ۱۹۸۴ − ۱۹۸۸ z=۱٫۸۱۹ This is a radio galaxy. At the time, the most remote object was quasar PKS 2000-330, at z=3.78, found in 1982. 3C ۲۴۱ ۱۹۸۴ z=۱٫۶۱۷ This is a radio galaxy. At the time, the most remote object was quasar PKS 2000-330, at z=3.78, found in 1982. 3C ۳۲۴ ۱۹۸۳ − ۱۹۸۴ z=۱٫۲۰۶ This is a radio galaxy. At the time, the most remote object was quasar PKS 2000-330, at z=3.78, found in 1982. 3C ۶۵ ۱۹۸۲ − ۱۹۸۳ z=۱٫۱۷۶ This is a radio galaxy. At the time, the most remote object was quasar OQ172, at z=3.53, found in 1974. In 1982, quasar PKS 2000-330 at z=3.78 became the most remote object. 3C ۳۶۸ ۱۹۸۲ z=۱٫۱۳۲ This is a radio galaxy. At the time, the most remote object was quasar OQ172, at z=3.53, found in 1974. 3C ۲۵۲ ۱۹۸۱ − ۱۹۸۲ z=۱٫۱۰۵ This is a radio galaxy. At the time, the most remote object was quasar OQ172, at z=3.53, found in ۱۹۷۴. 3C ۶٫۱ ۱۹۷۹ - z=۰٫۸۴۰ This is a radio galaxy. At the time, the most remote object was quasar OQ172, at z=3.53, found in 1974. 3C ۳۱۸ ۱۹۷۶ - ۰٫۷۵۲ This is a radio galaxy. At the time, the most remote object was quasar OQ172, at z=3.53, found in 1974. 3C ۴۱۱ ۱۹۷۵ - ۰٫۴۶۹ This is a radio galaxy. At the time, the most remote object was quasar OQ172, at z=3.53, found in 1974. 3C ۲۹۵ ۱۹۶۰ - z=۰٫۴۶۱ This is a radio galaxy. This was the remotest object known at time of discovery of its redshift. This was the last non-quasar to hold the title of most distant object known until 1997. In 1964, quasar 3C 147 became the most distant object in the universe known. (V=61000 km/s) This galaxy lies in the Hydra Supercluster. It is located at مبدأ (ستاره‌شناسی) ۰۸h ۵۵m ۴s ‏ ۲۱′ ‎+۰۳° and is the BCG of the fainter Hydra Cluster Cl 0855+0321 (ACO 732). (V=39000 km/s) The brightest cluster galaxy of the Bootes cluster (ACO 1930), an elliptical galaxy at مبدأ (ستاره‌شناسی) ۱۴h ۳۰m ۶s ‏ ۴۶′ ‎+۳۱° قدر ظاهری 17.8, was found by Milton L. Humason in 1936 to have a 40,000 km/s recessional redshift velocity. (V=3779 km/s) Using redshift measurements, NGC 7619 was the highest at the time of measurement. At the time of announcement, it was not yet accepted as a general guide to فاصله، however, later in the year, Edwin Hubble described redshift in relation to فاصله، leading to a seachange, and having this being accepted as an inferred فاصله. (V=1180 km/s) This was the second galaxy whose redshift was determined; the first being Andromeda - which is approaching us and thus cannot have its redshift used to infer فاصله. Both were measured by وستو اسلیفر. At this time, nebula had yet to be accepted as independent galaxies. NGC 4594 was originally measured as 1000 km/s, then refined to 1100, and then to 1180 in 1916. 11.8 Mly (z=-۰٫۱۰) This is the lower bound, as it is remotest galaxy observable with the naked-eye. It is 12 million light-years away. Redshift cannot be used to infer فاصله، because it's moving toward us faster than cosmological expansion. کهکشان فرفره ۱۹۳۰ - Using the pre-1950s Cepheid measurements, M101 was one of the most distant so measured. کهکشان سه‌تکه ۱۹۲۴–۱۹۳۰ In 1924, Edwin Hubble announced the فاصله to M33 Triangulum. کهکشان زن برزنجیر ۱۹۲۳–۱۹۲۴ In 1923, ادوین هابل measured the فاصله to Andromeda, and settled the question whether there were galaxies, or was everything in the Milky Way. ابر ماژلانی کوچک ۱۹۱۳–۱۹۲۳ This was the first intergalactic فاصله measured. In 1913, اینار هرتس‌اشپرونگ measures the فاصله to SMC using متغیر دلتا قیفاووسیs. In 1958, cluster Cl 0024+1654 and Cl 1447+2619 were estimated to have redshifts of z=0.29 and z=0.35 respectively. However, no galaxy was spectroscopically determined. The نوار ماژلانی are being tidally disrupted by the کهکشان راه شیری، resulting in the Magellanic Stream drawing a tidal tail away from the LMC and SMC, and the Magellanic Bridge drawing material from the clouds to our galaxy. These three galaxies interact with each other and draw out tidal tails, which are dense enough to form star clusters. The bridge of gas between these galaxies is known as Arp's Loop. کهکشان بچه قورباغه The Tadpole Galaxy tidally interacted with another galaxy in a close encounter, and remains slightly disrupted, with a long tidal tail. آرپ ۲۹۹ (آرپ ۲۹۹ & آرپ ۲۹۹) These two galaxies have recently collided and are now both barred irregular galaxies. Mayall's Object This is a pair of galaxies, one which punched through the other, resulting in a ring galaxy. دوشاخک (دوشاخک، دوشاخک & دوشاخک، دوشاخک) 2 galaxies Two spiral galaxies currently starting a collision, tidally interacting, and in the process of merger. Butterfly Galaxies (Siamese Twins Galaxies, NGC 4567 & NGC 4568) 2 galaxies Two spiral galaxies in the process of starting to merge. Mice Galaxies (NGC 4676, NGC 4676A & NGC 4676B, IC 819 & IC 820 , Arp 242) 2 galaxies Two spiral galaxies currently tidally interacting and in the process of merger. ان‌جی‌سی ۲۲۰۷ و آی‌سی ۲۱۶۳ (ان‌جی‌سی ۲۲۰۷ و آی‌سی ۲۱۶۳ & ان‌جی‌سی ۲۲۰۷ و آی‌سی ۲۱۶۳) 2 galaxies These are two spiral galaxies starting to collide, in the process of merger. Galaxy protocluster LBG-2377 z=۳٫۰۳ This was announced as the most distant galaxy merger ever discovered. It is expected that this proto-cluster of galaxies will merge together to form a brightest cluster galaxy, and become the core of a larger galaxy cluster. ان‌جی‌سی ۶۲۴۰ (ان‌جی‌سی ۶۲۴۰, ان‌جی‌سی ۶۲۴۰) This recently coalesced galaxy still has two prominent nuclei. 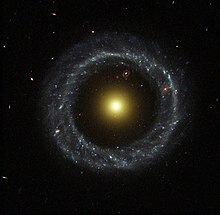 Canis Major Dwarf Galaxy کهکشان راه شیری The Monoceros Ring is thought to be the tidal tail of the disrupted CMa dg. Virgo Stellar Stream کهکشان راه شیری This is thought to be a completely disrupted dwarf galaxy. Sagittarius Dwarf Elliptical Galaxy کهکشان راه شیری M54 is thought to the be core of this dwarf galaxy. امگا قنطورس کهکشان راه شیری This is now categorized a خوشه ستاره‌ای کروی of the Milky Way. However, it is considered the core of a dwarf galaxy that the Milky Way cannibalized. Mayall II کهکشان زن برزنجیر This is now categorized a خوشه ستاره‌ای کروی of Andromeda. However, it is considered the core of a dwarf galaxy that Andromeda cannibalized. G350.1-0.3 باقی‌مانده ابرنواختر Due to its unusual shape, it was originally misidentified as a galaxy. ای‌اس‌او ۰۰۱-۱۳۷ مثلث جنوبی با قرار گرفتن در خوشهٔ کهکشانی ابل ۳۶۲۷، این کهکشان گازهای خود را با فشار (Intracluster medium) بر اثر سرعت بالای انتقال در خوشه از دست داده و یک دنباله متراکم بزرگ از شکل‌گیری ستارگان بر جا می‌گذارد. از ویژگی این دنبالهٔ شکل‌گیری ستارگان بیرون از کهکشان است که تاکنون دیده شده‌است. این کهکشان به ظاهر یک دنباله‌دار با سری که کهکشان و دمی که ستارگان و گاز است پدیدار می‌شود. ↑ ۱٫۰ ۱٫۱ Sobral, David; Matthee, Jorryt; Darvish, Behnam; Schaerer, Daniel; Mobasher, Bahram; Röttgering, Huub J. A.; Santos, Sérgio; Hemmati, Shoubaneh (4 June 2015). "Evidence For POPIII-Like Stellar Populations In The Most Luminous LYMAN-α Emitters At The Epoch Of Re-Ionisation: Spectroscopic Confirmation". The Astrophysical Journal. 808 (2): 139. arXiv:1504.01734. Bibcode:2015ApJ...808..139S. doi:10.1088/0004-637x/808/2/139. ↑ Burbidge, E. Margaret (1964). "The Strange Extragalactic Systems: Mayall's Object and IC 883". Astrophysical Journal. 140: 1617. Bibcode:1964ApJ...140.1617B. doi:10.1086/148070. ↑ Baade, W.; Minkowski, R. (1954). "On the Identification of Radio Sources". Astrophysical Journal. 119: 215. Bibcode:1954ApJ...119..215B. doi:10.1086/145813. ↑ John E. Bortle (فوریه 2001). "The Bortle Dark-Sky Scale". Sky & Telescope. ↑ Barbara Wilson & Larry Mitchell. "The Revised AINTNO 100". ↑ Stephen Uitti. "Farthest Naked Eye Object". Retrieved ۲۰۰۸-۱۱-۰۱. ↑ S. J. O'Meara (۱۹۹۸). The Messier Objects. Cambridge University Press. ISBN ۰-۵۲۱-۵۵۳۳۲-۶. ↑ Brian Skiff (10 January 1997). "Messier 81 naked-eye". sci.astro.amateur. ↑ Inglis, Mike. "Galaxies": ۱۵۷–۱۸۹. doi:10٫1007/978-1-84628-736-7_4 Check |doi= value (help). ↑ Burbidge, G. (۱۹۹۹). "Baade & Minkowski's Identification of Radio Sources". Astrophysical Journal. ۵۲۵: ۵۶۹. Bibcode:1999ApJ...525C.569B. ↑ SEDS, Lord Rosse's drawings of M51, his "Question Mark" "Spiral Nebula"
↑ ۲۳٫۰ ۲۳٫۱ Julie McEnery. "Time Variability of the TeV Gamma-Ray Emission from Markarian 421". Iac.es. Retrieved ۲۰۰۸-۱۱-۰۱. ↑ Romani; David Sowards-Emmerd; Lincoln Greenhill; Peter Michelson (۲۰۰۴). "Q0906+6930: The Highest-Redshift Blazar". The Astrophysical Journal. ۶۱۰: L9–L11. arXiv:astro-ph/0406252. Bibcode:2004ApJ...610L...9R. doi:10٫1086/423201 Check |doi= value (help). ↑ Rodríguez Zaurín, J.; Tadhunter, C. N.; González Delgado, R. M. (۲۰۰۸). "Optical spectroscopy of Arp220: the star formation history of the closest ULIRG". Monthly Notices of the Royal Astronomical Society. ۳۸۴ (۳): ۸۷۵. Bibcode:2008MNRAS.384..875R. doi:10.1111/j.1365-2966.2007.12658.x. ↑ Murray, Steven (۱۹۹۹). "ACIS Imaging of the Starburst Galaxy M82". Chandra Proposal ID #01700041: ۳۶۲. Bibcode:1999cxo..prop..362M. ↑ Grebel (۲۰۰۰). "Star Clusters in Local Group Galaxies". , "Massive Stellar Clusters", ASP Conf. Ser. Vol. , eds. A. Lancon & C. Boily (Provo:ASP). ۲۰۰۰ (۲۱۱): ۲۶۲–۲۶۹. arXiv:astro-ph/9912529. Bibcode:2000ASPC..211..262G. ↑ ۳۴٫۰ ۳۴٫۱ ۳۴٫۲ Lehnert, M. D.; Nesvadba, N. P. H.; Cuby, J. -G.; Swinbank, A. M.; Morris, S.; Clément, B.; Evans, C. J.; Bremer, M. N.; Basa, S. (۲۰۱۰). "Spectroscopic confirmation of a galaxy at redshift z = ۸٫۶". Nature. ۴۶۷ (۷۳۱۸): ۹۴۰–۹۴۲. arXiv:1010٫4312 Check |arxiv= value (help). Bibcode:2010Natur.467..940L. doi:10.1038/nature09462. PMID 20962840. ↑ Capak, Peter; Carilli, C. L.; Lee, N.; Aldcroft, T.; Aussel, H.; Schinnerer, E.; Wilson, G. W.; Yun, M. S.; Blain, A. (۲۰۰۸). "Spectroscopic Confirmation of an Extreme Starburst at Redshift 4.547". The Astrophysical Journal. ۶۸۱ (۲): L53–L56. arXiv:0806٫0657 Check |arxiv= value (help). Bibcode:2008ApJ...681L..53C. doi:10٫1086/590555 Check |doi= value (help). ↑ ۳۷٫۰ ۳۷٫۱ Yoshi Taniguchi (۲۰۰۸). "Star Forming Galaxies at z> ۵". Proceedings of the International Astronomical Union. ۳. arXiv:0804٫0644 Check |arxiv= value (help). doi:10.1017/S1743921308020796. ↑ Kodaira; Taniguchi; Kashikawa; Kaifu; Ando; Karoji (۲۰۰۳). "The Discovery of Two Lyman-α Emitters Beyond Redshift 6 in the Subaru Deep Field". arXiv:astro-ph/0301096 [astro-ph]. ↑ Hu, E. M.; Cowie, L. L.; McMahon, R. G.; Capak, P.; Iwamuro, F.; Kneib, J. -P.; Maihara, T.; Motohara, K. (۲۰۰۲). "A Redshift [CLC][ITAL]z[/ITAL][/CLC] = 6.56 Galaxy behind the Cluster Abell 370". The Astrophysical Journal. ۵۶۸ (۲): L75–L79. arXiv:astro-ph/0203091. Bibcode:2002ApJ...568L..75H. doi:10٫1086/340424 Check |doi= value (help). ↑ Hu, Esther M.; McMahon, Richard G.; Cowie, Lennox L. (۱۹۹۹). "An Extremely Luminous Galaxy at [CLC][ITAL]z[/ITAL][/CLC] = ۵٫۷۴". The Astrophysical Journal. ۵۲۲: L9–L12. arXiv:astro-ph/9907079. Bibcode:1999ApJ...522L...9H. doi:10٫1086/312205 Check |doi= value (help). ↑ ۵۰٫۰ ۵۰٫۱ Arjun Dey; Hyron Spinrad; Daniel Stern; Graham; Chaffee (۱۹۹۸). "A Galaxy at z=۵٫۳۴". arXiv:astro-ph/9803137 [astro-ph]. ↑ Franx, Marijn; Illingworth, Garth D.; Kelson, Daniel D.; Van Dokkum, Pieter G.; Tran, Kim-Vy (۱۹۹۷). "A Pair of Lensed Galaxies at [CLC][ITAL]z[/ITAL][/CLC] = 4.92 in the Field of CL 1358+62". The Astrophysical Journal. ۴۸۶ (۲): L75–L78. arXiv:astro-ph/9704090. Bibcode:1997ApJ...486L..75F. doi:10٫1086/310844 Check |doi= value (help). ↑ Wil van Breugel; Carlos De Breuck; Adam Stanford; Huub Röttgering; George Miley; Daniel Stern; Dante Minniti; Chris Carilli (۱۹۹۹). "Ultra-Steep Spectrum Radio Galaxies at Hy Redshifts". arXiv:astro-ph/9910311 [astro-ph]. ↑ ۵۶٫۰ ۵۶٫۱ Hyron Spinrad; Arjun Dey; Graham (۱۹۹۵). "Keck Observations of the Most Distant Galaxy: 8C1435+63 at z=۴٫۲۵". The Astrophysical Journal. ۴۳۸: L51. arXiv:astro-ph/9411007. Bibcode:1995ApJ...438L..51S. doi:10٫1086/187713 Check |doi= value (help). ↑ Miley, G. K.; Chambers, K. C.; van Breugel, W. J. M.; Macchetto, F. (۱۹۹۲). "Hubble Space Telescope imaging of distant galaxies - 4C 41.17 at Z = ۳٫۸". Astrophysical Journal. ۴۰۱: L69. Bibcode:1992ApJ...401L..69M. doi:10٫1086/186673 Check |doi= value (help). ↑ ۵۹٫۰ ۵۹٫۱ Chambers, K. C.; Miley, G. K.; van Breugel, W. J. M. (۱۹۹۰). "4C 41.17 - A radio galaxy at a redshift of 3.8". Astrophysical Journal. ۳۶۳: ۲۱. Bibcode:1990ApJ...363...21C. doi:10٫1086/169316 Check |doi= value (help). ↑ Paola Mazzei; Gianfranco De Zotti (۱۹۹۵). "Dust in High Redshift Radio Galaxies and the Early Evolution of Spheroidal Galaxies". arXiv:astro-ph/9509108 [astro-ph]. ↑ Le Fevre, O.; Hammer, F.; Nottale, L.; Mazure, A.; Christian, C. (۱۹۸۸). "Peculiar morphology of the high-redshift radio galaxies 3C 13 and 3C 256 in subarcsecond seeing". Astrophysical Journal. ۳۲۴: L1. Bibcode:1988ApJ...324L...1L. doi:10٫1086/185078 Check |doi= value (help). ↑ ۶۴٫۰ ۶۴٫۱ Lilly, S. J.; Longair, M. S. (۱۹۸۴). "Stellar populations in distant radio galaxies". Royal Astronomical Society. ۲۱۱: ۸۳۳. Bibcode:1984MNRAS.211..833L. ↑ Longair, M. S. (۱۹۸۴). "The Most Distant Galaxies". Journal of the British Astronomical Association. ۹۴: ۹۷. Bibcode:1984JBAA...94...97L. ↑ Smith, H. E.; Junkkarinen, V. T.; Spinrad, H.; Grueff, G.; Vigotti, M. (۱۹۷۹). "Spectrophotometry of three high-redshift radio galaxies - 3C 6.1, 3C 265, and 3C 352". The Astrophysical Journal. ۲۳۱: ۳۰۷. Bibcode:1979ApJ...231..307S. doi:10٫1086/157194 Check |doi= value (help). ↑ McCarthy, P J (۱۹۹۳). "High Redshift Radio Galaxies". Annual Review of Astronomy and Astrophysics. ۳۱: ۶۳۹–۶۸۸. Bibcode:1993ARA&A..31..639M. doi:10.1146/annurev.aa.31.090193.003231. ↑ ۷۰٫۰ ۷۰٫۱ ۷۰٫۲ Sandage, Allan (۱۹۶۱). "The Ability of the 200-INCH Telescope to Discriminate Between Selected World Models". Astrophysical Journal. ۱۳۳: ۳۵۵. Bibcode:1961ApJ...133..355S. doi:10٫1086/147041 Check |doi= value (help). ↑ Hubble, E. P. (۱۹۵۳). "The law of red shifts (George Darwin Lecture)". Monthly Notices of the Royal Astronomical Society. ۱۱۳: ۶۵۸. Bibcode:1953MNRAS.113..658H. ↑ Humason, M. L.; Mayall, N. U.; Sandage, A. R. (۱۹۵۶). "Redshifts and magnitudes of extragalactic nebulae". Astron. J. ۶۱: ۹۷. Bibcode:1956AJ.....61...97H. doi:10٫1086/107297 Check |doi= value (help). ↑ ۷۴٫۰ ۷۴٫۱ ۷۴٫۲ "1053 May 8 meeting of the Royal Astronomical Society". The Observatory. ۷۳: ۹۷. ۱۹۵۳. Bibcode:1953Obs....73...97. ↑ Merrill, Paul W. (۱۹۵۸). "From Atoms to Galaxies". Astronomical Society of the Pacific Leaflets. ۷: ۳۹۳. Bibcode:1958ASPL....7..393M. ↑ ۷۷٫۰ ۷۷٫۱ Humason, M. L. (۱۹۳۶). "The Apparent Radial Velocities of 100 Extra-Galactic Nebulae". Astrophysical Journal. ۸۳: ۱۰. Bibcode:1936ApJ....83...10H. doi:10٫1086/143696 Check |doi= value (help). ↑ ۷۹٫۰ ۷۹٫۱ Chant, C. A. (۱۹۳۲). "ملاحضات and Queries (Doings at Mount Wilson-Ritchey's Photographic Telescope-Infra-red Photographic Plates)". Journal of the Royal Astronomical Society of Canada. ۲۶: ۱۸۰. Bibcode:1932JRASC..26..180C. ↑ Humason, Milton L. (۱۹۳۱). "Apparent Velocity-Shifts in the Spectra of Faint Nebulae". Astrophysical Journal. ۷۴: ۳۵. Bibcode:1931ApJ....74...35H. doi:10٫1086/143287 Check |doi= value (help). ↑ Hubble, Edwin; Humason, Milton L. (۱۹۳۱). "The Velocity-فاصله Relation among Extra-Galactic Nebulae". Astrophysical Journal. ۷۴: ۴۳. Bibcode:1931ApJ....74...43H. doi:10٫1086/143323 Check |doi= value (help). ↑ ۸۲٫۰ ۸۲٫۱ Humason, M. L. (۱۹۳۱). "The Large Apparent Velocities of Extra-Galactic Nebulae". Astronomical Society of the Pacific Leaflets. ۱: ۱۴۹. Bibcode:1931ASPL....1..149H. ↑ Humason, M. L. (۱۹۳۰). "The Rayton short-focus spectrographic objective". Astrophys. J. ۷۱: ۳۵۱. Bibcode:1930ApJ....71..351H. doi:10٫1086/143255 Check |doi= value (help). ↑ ۸۴٫۰ ۸۴٫۱ ۸۴٫۲ ۸۴٫۳ Trimble, Virginia (۱۹۹۶). "H_0: The Incredible Shrinking Constant, 1925-1975". Publications of the Astronomical Society of the Pacific. ۱۰۸: ۱۰۷۳. Bibcode:1996PASP..108.1073T. doi:10٫1086/133837 Check |doi= value (help). ↑ "The Berkeley Meeting of the Astronomical Society of the Pacific, June 20–21, 1929". Publications of the Astronomical Society of the Pacific. ۴۱: ۲۴۴. ۱۹۲۹. Bibcode:1929PASP...41..244.. doi:10٫1086/123945 Check |doi= value (help). ↑ Bailey, S. I. (۱۹۲۰). "Comet Skjellerup". Harvard College Observatory Bulletin No. 739. ۷۳۹: ۱. Bibcode:1920BHarO.739....1B. ↑ Hsiao-Wen Chen; Lanzetta; Sebastian Pascarelle; Noriaki Yahata (۲۰۰۰). "The Unusual Spectral Energy Distribution of a Galaxy Previously Reported to be at Redshift 6.68". arXiv:astro-ph/0011558 [astro-ph]. ↑ Hu; McMahon (۱۹۹۶). "Detection of Lyman-alpha Emitting Galaxies at Redshift z=۴٫۵۵". Nature. ۳۸۲ (۶۵۸۸): ۲۳۱–۲۳۳. arXiv:astro-ph/9606135. Bibcode:1996Natur.382..231H. doi:10.1038/382231a0. ↑ Elston, Richard; Bechtold, Jill; Hill, Gary J.; Ge, Jian (۱۹۹۶). "A Redshift 4.38 MG II Absorber toward BR 1202-0725". Astrophysical Journal Letters v.456. ۴۵۶: L13. Bibcode:1996ApJ...456L..13E. doi:10٫1086/309853 Check |doi= value (help). ↑ Smail, I.; Ellis, R. S.; Aragon-Salamanca, A.; Soucail, G.; Mellier, Y.; Giraud, E. (۱۹۹۳). "The Nature of Star Formation in Lensed Galaxies at High Redshift". R.a.s. Monthly Notices V.263. ۲۶۳: ۶۲۸. Bibcode:1993MNRAS.263..628S. ↑ Djorgovski, S.; Strauss, Michael A.; Spinrad, Hyron; McCarthy, Patrick; Perley, R. A. (۱۹۸۷). "A galaxy at a redshift of 3.215 - Further studies of the PKS 1614+051 system". Astronomical Journal (ISSN 0004-6256). ۹۳: ۱۳۱۸. Bibcode:1987AJ.....93.1318D. doi:10٫1086/114414 Check |doi= value (help). ↑ NED, Searching NED for object "3C 123"
↑ Spinrad, H. (۱۹۷۵). "3C 123: a distant first-ranked cluster galaxy at z = ۰٫۶۳۷". Astrophys. J. ۱۹۹: L3. Bibcode:1975ApJ...199L...3S. doi:10٫1086/181835 Check |doi= value (help). ↑ Cooke, Jeff; Barton, Elizabeth J.; Bullock, James S.; Stewart, Kyle R.; Wolfe, Arthur M. (۲۰۰۸). "A Candidate Brightest Protocluster Galaxy atz= ۳٫۰۳". The Astrophysical Journal. ۶۸۱ (۲): L57–L60. Bibcode:2008ApJ...681L..57C. doi:10٫1086/590406 Check |doi= value (help). ↑ "Black hole found in Omega Centauri". United Press International. 10 April 2008. مشارکت‌کنندگان ویکی‌پدیا. «List of galaxies». در دانشنامهٔ ویکی‌پدیای انگلیسی، بازبینی‌شده در ۱۵ می ۲۰۱۲.